By Laura Kostelny | 9 years ago Maleiah and Ryan Rogers bring a little old Hollywood glamour — OK, a lot — to their neighborhood. By Laura Kostelny | 9 years ago When life threw Patty McCormack a curveball, she was looking for a change. So she packed up the kids, left for Pottsboro, and never looked back. By Peggy Levinson | 9 years ago Light and nature meet crystal and lucite in this Dallas house. By D Magazine | 9 years ago It’s not nice to judge a book by its cover. But when it comes to these anything-but-boring bookends, judge away. By Christine Allison | 9 years ago My mother-in-law's big move signals the end of an era. By Raya Ramsey | 9 years ago The eclectic store doubles the fun with a new location. By Peggy Levinson | 9 years ago Check out our finds featuring this cool shade. 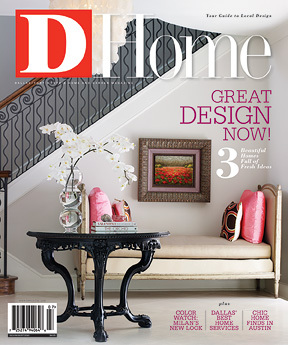 By D Magazine | 9 years ago Five bedrooms in Lakewood, a rebuilt Preston Hollow home, or the "queen" of Swiss Avenue. By Peggy Levinson | 9 years ago Great finds by D Home editor Peggy Levinson. How Do You Stay Cool in the Dallas Heat? By D Magazine | 9 years ago In celebration of D Home’s 10th anniversary, we asked 10 local stylemakers. By Kellyn Curtis | 9 years ago Owners Randolph Phillips and Julia Elam celebrate their Oak Lawn hotspot's fifth birthday. By D Magazine | 9 years ago Find gated elegance in this Collin County enclave. By D Magazine | 9 years ago Life’s a beach with a little Grade A fish. By Laura Kostelny | 9 years ago This issue is full of advice enjoying the city both indoors and out. By D Magazine | 9 years ago Five bedrooms in Far North Dallas, a farmhouse in the center of town, or a new Highland Park home. By D Magazine | 9 years ago A midcentury modern in Forest Hills, a great Lake Highlands location, or three bedrooms in the Disney Streets. By Ryan Connor | 9 years ago Let the masses huddle at UT games. Spend your time—and money—touring the city’s impressive home shopping network. Nest beautifully with our weekly newsletter from the editors of D Home.